dance.net - Beautiful Mary Skotnicki Dress (10241105) - Read article: Ballet, Jazz, Modern, Hip Hop, Tap, Irish, Disco, Twirling, Cheer: Photos, Chat, Games, Jobs, Events! 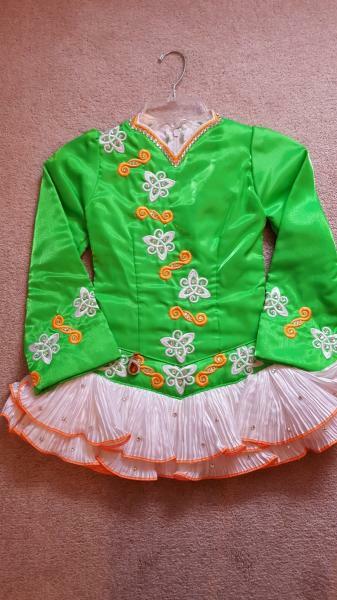 This beautiful, bright green, orange and white satin Mary Skotnicki dress is suitable for a 7-9 year old dancer (about a kids size 7/8). This dress really stands out on stage. It has been stored flat in a smoke free home and is in excellent condition. It was custom designed by the dancer and Mary Skotnicki. It is adorned with numerous Swarovski crystals and has great stage presence. This would be a great dress for a novice/open prizewinner. COMES WITH: a cape, matching cape pin, orange bloomers, two headpieces, and an extra ruffle for the skirt. 2.5" of let down in sleeve length. Bodice 2.5" for let down of skirt, .5" on each side of bodice for let out and extra ruffle for skirt. Will accept return and refund dress price. Shipping is included if within the USA.